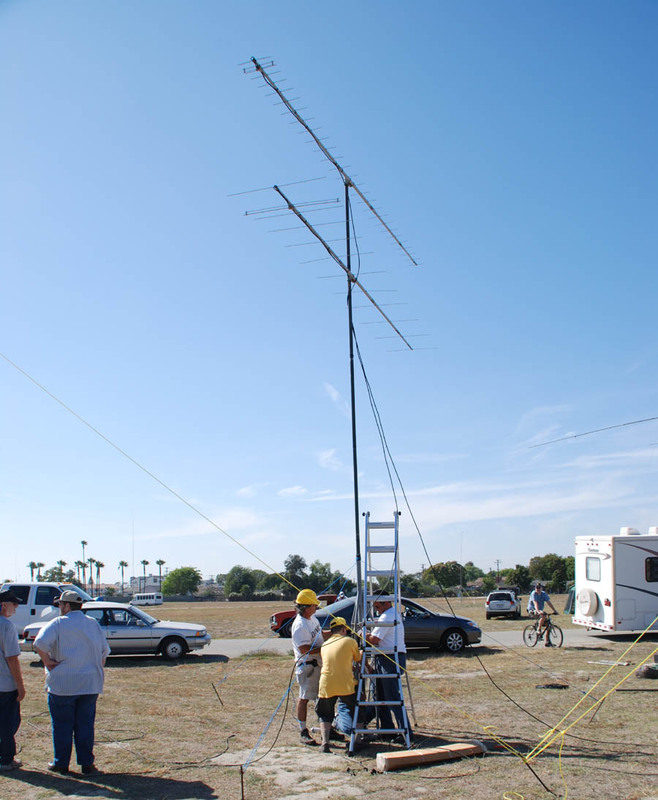 This year the OCARC again held Field Day at Los Alamitos Joint Forces Training Base, ideal with it's huge fields for an antenna farm and quiet noise conditions. 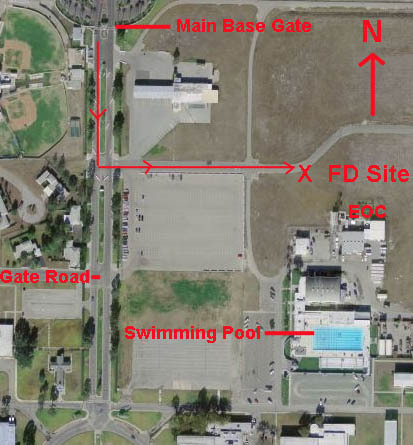 The FD antennas occupied the fields both North and East of the "X" on the map. 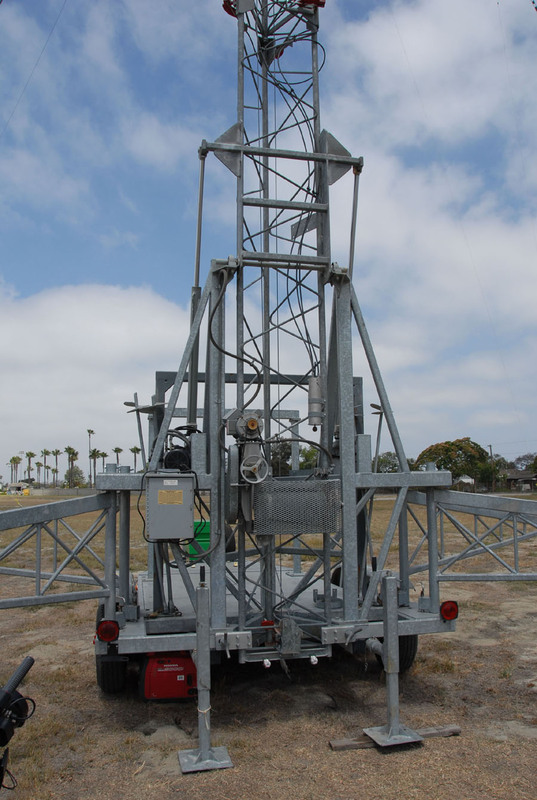 The center-piece for the the OCARC FD towers was a 100-foot self-supporting crank-up tower on a trailer, courtesey of the efforts of Dino-K6RIX. Here is a close-up view of the remotely controlled "toe-stops" on the 100-ft tower that provide a resting mechanism for each tower section when fully cranked-up. This is what the self-supporting 100-ft tower looked like when fully raised.. The 20M SSB station tent starts to take shape on Friday afternoon. 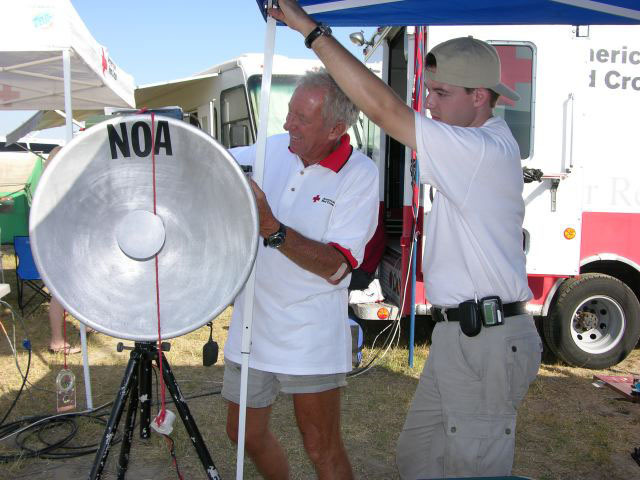 Band Captain, Dan N6PEQ can be seen in the back of the tent by the flat-panel display with FD Chairman Willie-N8WP giving a hand. 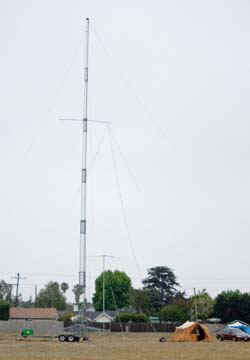 Dan-N6PEQ (L) and Chip-K7JA (R) walk up the OCARC's 40-foot aluminum tower for the 20M SSB 3-ele 20M mono-bander beam. 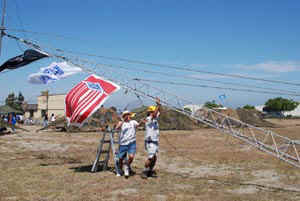 You can see that other members are pulling on the tower guy ropes. 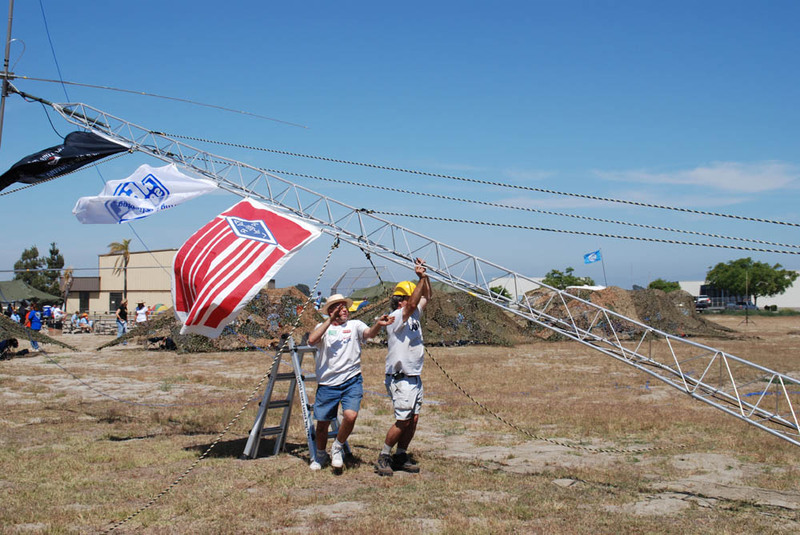 The 20M SSB Force-12 3-ele beam is almost in place. 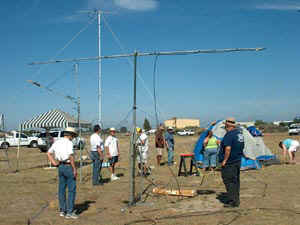 Dan-N6PEQ stabilizes th base while Ken-KI6DK holds one of the guy ropes. This year OCARC had a dedicated YL station. 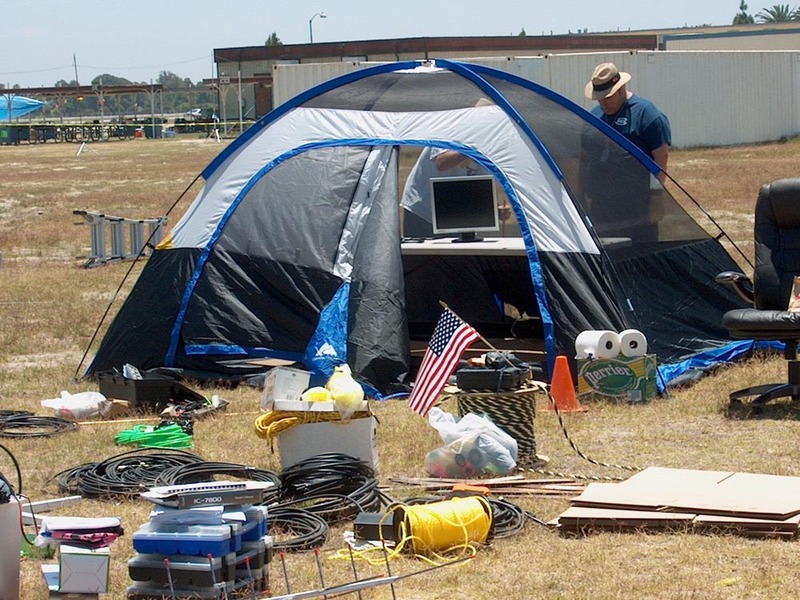 The 15M75M SSB YL station tent starts to take shape on Friday afternoon. (L-R) Band Captain, Kristin-N6PEQ, Cheryl-KG6KTT, and Beverly-KI6APH. 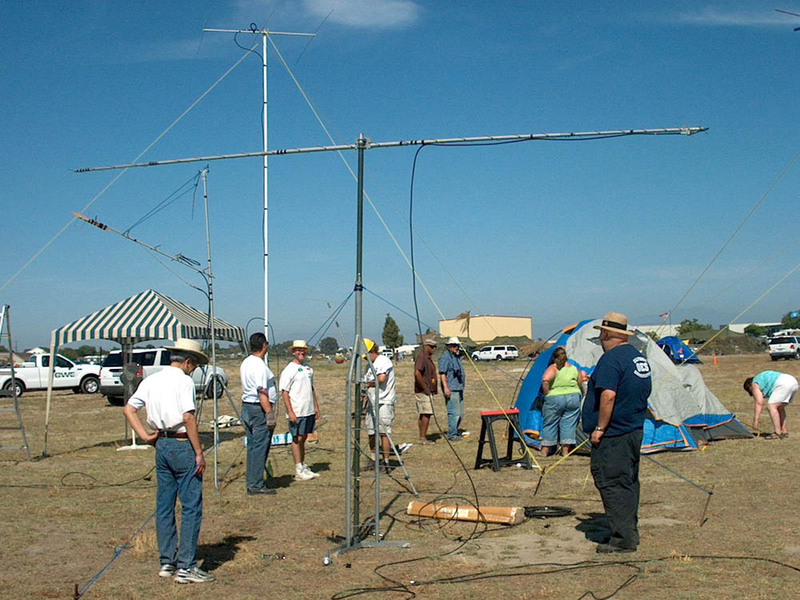 On the right is Tom Woodard-KI6GOA. 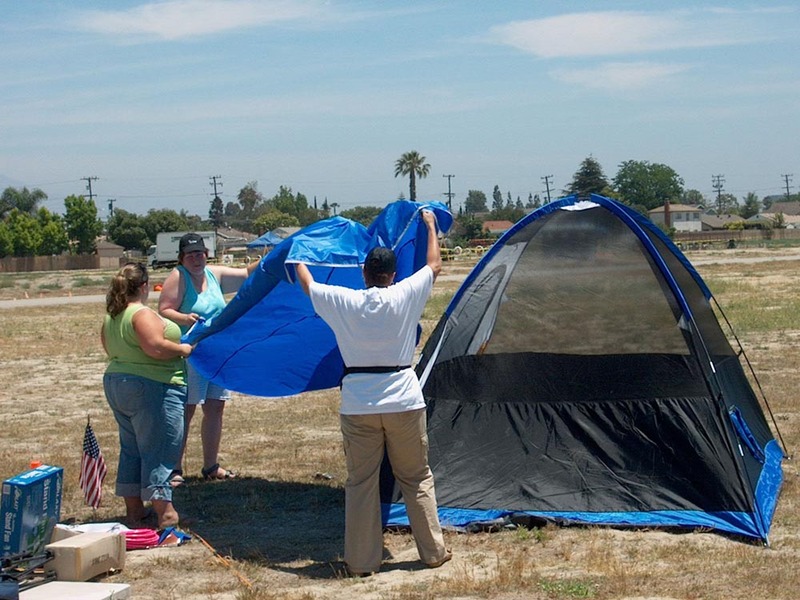 of the Red Cross who set-up a display for Red Cross Disater Services and provided a tent and liquids for escape from the sun. On the left, Gordon West-WB6NOA puts finishing touches to setting a 10 GHz dish for some demos and points. 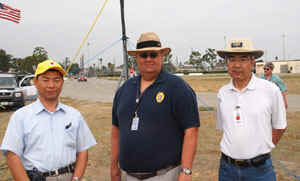 To the left is visitor Katsutoshi-JK1PHL/ AF6CQ who traveled to the US just to see the OCARC FD (he is interested in improving Emergency Preparedness and Ham Public Service in his country). While visiting, Professor Katsutoshi explained that FD is not so wide-spread or so well-organized in Japan. 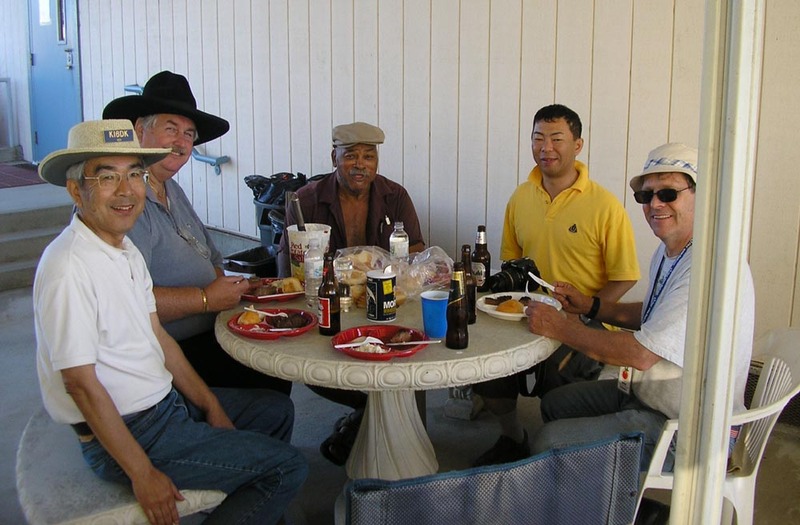 In the middle is Willie N8WP, our FD chairperson, and to his right is Ken Kinoshita - KI6DK (who was a member of OCARC 20 yrs earlier before returning to JA-land and has now recently returned and rejoined the club). 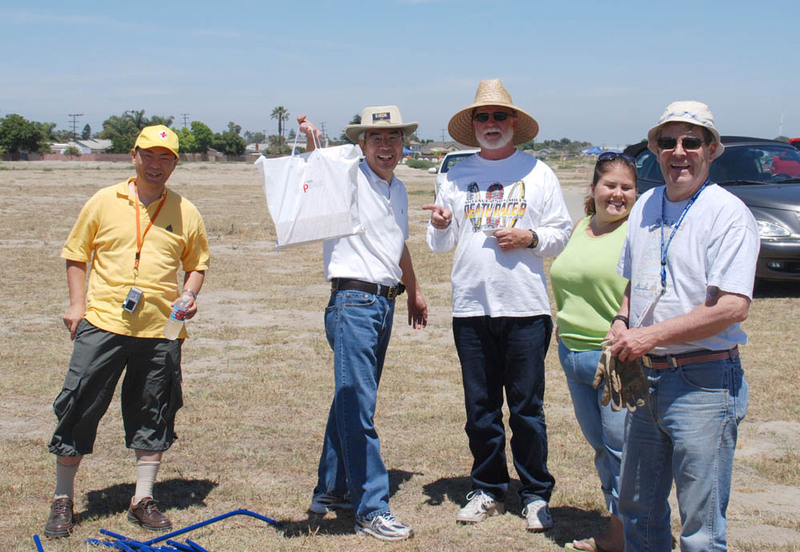 (L-R) Katsutoshi-JK1PHL/AF6CQ, Ken-KI6DK, Rich-KE6WWK, President Kristin-K6PEQ and a happy Bob-AF6C. Bob-AF6C is so happy because Ken-KI6DK presented the club with two bottles of Sake (in the bag)...for the traditional FD Sake party Saturday night. Band Captain Chip-K7JA (center with yellow hard-hat) was in charge of many VHF/UHF antennas. 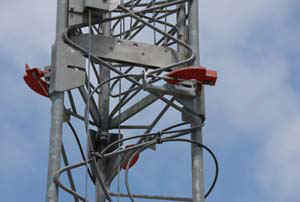 These included antennas for 6M, 144, 440, 1.2 GHz, and satellite. 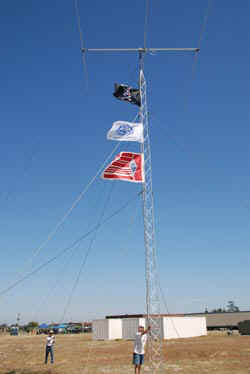 At the top of a 20-ft tower is an 28-ele 440 MHz Yaggi beam and below it is a 12-ele 144 MHz Yaggi beam. 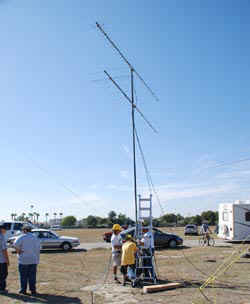 The antenna farm for 10M-SSB/6M/144/440/1.2 and satellite is being set up on Friday afternoon. The satelitte antenna is just above the canopy roof on the left-side of the picture. 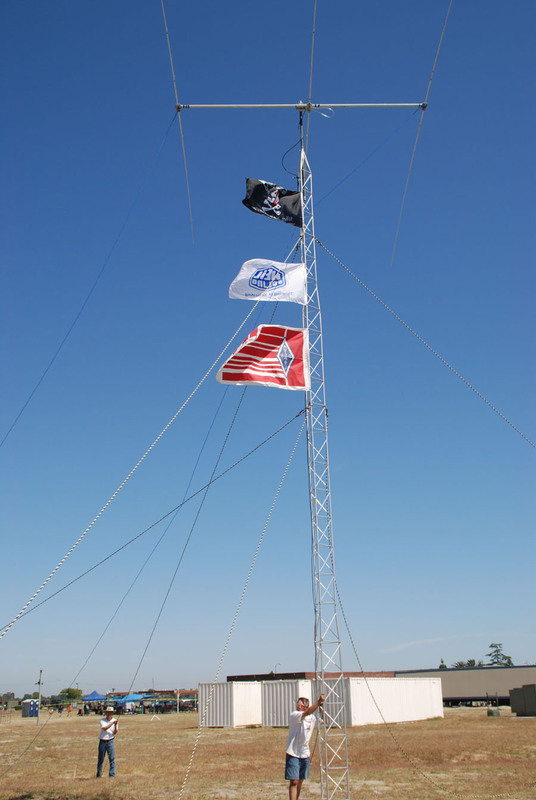 The 440 MHz Yaggi on the long boom is in the center of the picture on a short mast. The tallest antenna in this photo is a 3-ele 6M beam. In the photo from L-R are Ken-KI6DK, John-WB6AJE, Dan-N6PEQ, Band Captain Chip-K7JA (in yellow hard hat), Frank-WF1A, Ken-W6HHC, Kristin-K6PEQ, Willie-N8WP, and Cheryl-KG6KTT. 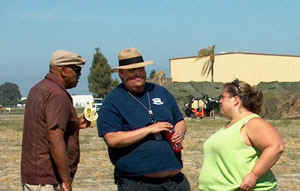 Another visitor to FD was Frank-WF1A (L), who travels in his motorhome and is a long-time friend of Willie-N8WP (C) and certainly a friend of the OCARC. The OCARC President, Kristin-K6PEQ, joins in on the discussions. 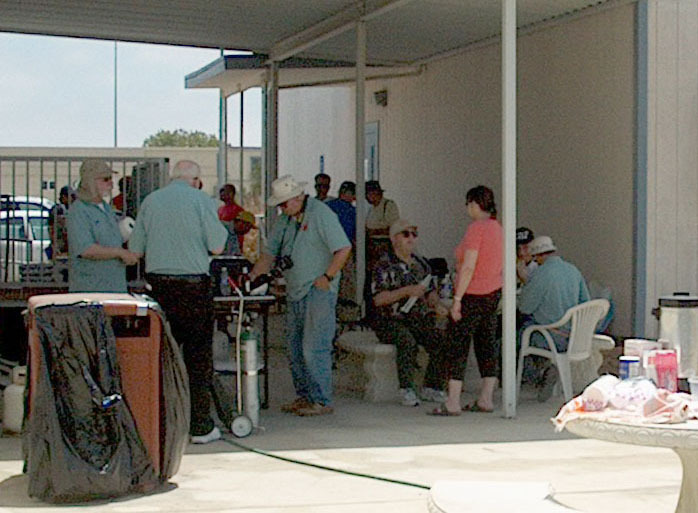 After a lot of hard work on Friday afternoon to put up towers and antennas, the club served steak dinners to the set-up crew. (L-R) Rich-KE6WWK (who was helping with the cooking), Bruce-KC6DLA, Ken-W6HHC, Michael-KI6DHT (seated), ??? (in orange blouse), and Bob-AF6C (seated with white hat). At the end of the day on Friday, after antenna set ups are completed, the sun sets over the Pacific Ocean. 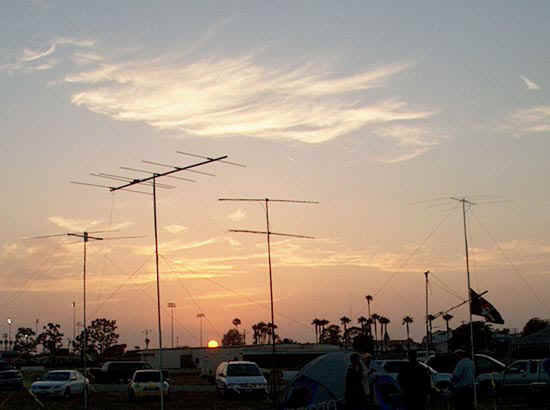 The VHF/UHF antenna farm is silhouetted in this beautiful California sunset.